The U.S. Navy required asbestos and asbestos-containing materials be used to build its ships despite understanding some of the health hazards associated with asbestos exposure, a recent research report concludes. The report “Government and Navy Knowledge Regarding Health Hazards of Asbestos: A State of The Science Evaluation (1900 To 1970)” was created by ChemRisk, a San Francisco-based chemical risk assessment company. 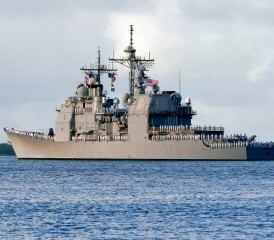 Published in December, it highlights the Navy’s knowledge and actions regarding asbestos, a well-documented carcinogen. Some believe that this research may provide more insight into why veterans account for as much as one-third of all patients who suffer from mesothelioma, a disease associated with asbestos exposure. Analysis of the Navy’s knowledge and actions involving asbestos was divided into three time periods: 1900-1929, 1930-1959, and 1960-1970. The report uncovered that the unique properties and functions of asbestos made it attractive and preferred by the Navy, especially during times of war and rapid military expansion. The toxic material has been known to be a great insulator and to be heat resistant, both chemical characteristics that can be beneficial on a Navy ship. Whether the Navy knew this same information at the time is unsure. One thing that is apparent, according to the report, is that four years later, the Navy recommended that controls be put in place when handling asbestos, indicating an understanding of the potential dangers that asbestos may pose. Even earlier than that, the authors of the document cite that the toxic mineral was being associated with diseases as far back as 1907. During this time, lung disease was initially being correlated with asbestos exposure, with supporting articles being published in the 1920s. However, because of the presence of complicating diseases like tuberculosis, medical experts were unable to conclusively determine the causes of some cancers. The report states that the Navy continued to mandate that asbestos-containing materials be used on their ships between 1960 and 1970, even as mesothelioma was clearly being linked to asbestos exposure. At the same time, the branch was also recommending that all necessary precautions be performed anytime the toxic material was being handled. Most notably, the report makes a statement that insists that this military branch understood more about asbestos than some would think. Such an assertion may not be comforting enough to those affected by the toxic material. This may be just the beginning stages of the discussion as to what the Navy knew and didn’t know and whether its actions were in good faith or not. One thing that is certain is the necessity for help for those who have been exposed to asbestos or similar toxins.